The Seaport District is located on the east side of the Fort Point Channel in South Boston. There are three hotels in the Seaport District, including the Seaport Hotel, Renaissance Hotel, and the Westin Boston Waterfront Hotel. 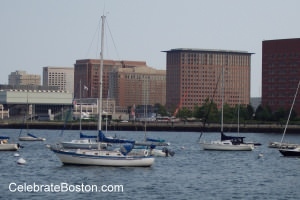 The hotels all rate at 4 stars, and are located within walking distance of the nearby attractions, including the Harborwalk path which connects all the wharves in downtown Boston. There are several major attractions in the Seaport District, including the Children's Museum. Fan Pier, Institute of Contemporary Art, Seaport World Trade Center, Blue Hills Bank Pavilion, Boston Cruiseport, and the Boston Convention Center. In the 1800s, the Seaport District was just a large tidal marsh known as Commonwealth Flats as it was owned by the Commonwealth of Massachusetts. The flats were developed and large wharves, railroad yards, and warehouses were constructed there. For a brief time, the area was also called the Garment District, Leather District, and Artist Community, and was finally transformed into the modern Seaport District in the late 1990s. The centerpiece of the Seaport District is the Boston Convention Center, a world-class conference center located on Summer Street. Opposite BCC is the Seaport World Trade Center, the descendant of the old Commonwealth Pier after a multi-million dollar renovation. The three hotels in the district are are within walking distance of the conference centers. The Seaport Boston Hotel is affiliated with the Seaport World Trade Center. The hotel is located just across the street from the WTC. The hotel is known for its modern fitness center, and also has an indoor pool. Just to the west of the hotel is the Spirit of Boston dinner cruise ship, and the tute of Contemporary Art. One can walk up the Harborwalk over the Northern Avenue footbridge to downtown Boston. The Boston Convention Center is just one long block south of the hotel. WTC has a separate building known as The Lighthouse, with 18' glass windows that offer beautiful panoramic views of the city, and is a popular venue for wedding receptions. The Renaissance Boston Hotel is located further west near the Blue Hills Bank Pavilion, a summer concert venue. The World Trade Center is a short distance away up Seaport Boulevard. The hotel is the nearest hotel to the Boston Cruiseport facility, also known as the Black Falcon Cruise Terminal. Rooms facing west from the Renaissance can offer nice views of downtown Boston, while some rooms facing east provide unique views of Logan Airport, Castle Island, and Boston Harbor. The Westin Boston Waterfront Hotel is adjacent to the Boston Convention Center. It's literally a just few yards walk from the hotel to the main entrance to the convention center. Guests can also walk from the Westin to the World Trade Center, which is one long block up a direct street known as World Trade Center Boulevard. Please remember that the Seaport District can be very windy during winter, so dress appropriately if one decides to stroll to the different attractions in the neighborhood in cold weather. The Westin is located on Summer Street, which goes to South Station and the south end of the Financial District. The Seaport District is a unique neighborhood of Boston. It could also be considered the Convention Center District due to the two major conference facilities located within its borders. Views of downtown Boston from the Seaport Boston, Renaissance, or Westin Hotels can be very beautiful from some of the rooms. The Seaport District is also very close to Logan Airport, and can be reached quickly by driving through the Ted Williams tunnel, or taking the Silver Line buses to the airport. Also note, that during summer the ICA usually sponsors open-air free concerts at its waterfront home on Northern Avenue. Area: Seaport District, Map Pin "A"
Area: Seaport District, Map Pin "B"
Area: Seaport District, Map Pin "C"